Students at Utica Community Schools in Sterling Heights, MI, are using mixed reality to explore interactive 3-D models of objects and concepts that would otherwise be abstract to them, such as a beating human heart or Newtonian physics. The students are using zSpace, a mixed reality system for K–12 education. According to Elizabeth Lytle, director of education and product experience at zSpace, mixed reality blends augmented and virtual reality technology. In virtual reality (VR), users wear a headset and headphones to become fully immersed in a virtual environment. In augmented reality (AR), users see computer-generated images overlaid on the real environment. Mixed reality combines elements of both. "We have true augmented reality in our zView software, and then the actual interaction is really a cross between VR and AR," says Lytle. "We've just transitioned to [the term] 'mixed reality,' which is defined as a combination of those elements." With zSpace, students work in groups of two in front of the zSpace all-in-one desktop computer system. 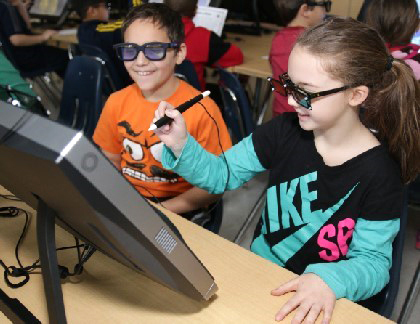 One student—the driver—wears a pair of tracked glasses and uses a handheld stylus to manipulate 3-D images in the zSpace. Another student—the passenger—wears a pair of follower glasses to see the 3-D images controlled by the driver. Utica Community Schools has the zSpace system installed in computer labs at four of its elementary schools. Each zSpace lab has 16 student stations, which accommodate two students each, plus one teacher station. The teacher station includes zView software, which allows the teacher to project the images onto an interactive whiteboard for class demonstrations. So far, the district has been using zSpace primarily for science in grades three to six. However, the system offers content for K–12 science, math, engineering, geography, English language arts, and art. Catherine Einhaus, director of elementary programs at Utica Community Schools, says the technology enables students to experience a real-life application of concepts, particularly in science. Normally studying the internal workings of the human body is a somewhat abstract concept for students. Beyond pictures and videos, they generally don't get to see organs—such as the human heart—at work. With zSpace, however, students can explore an interactive 3-D model of a functioning heart. They can move it around, look inside, and even feel the heartbeat through the stylus. Einhaus says teachers sometimes begin a lesson by letting students work with a 3-D model in zSpace to explore and discover the concept on their own. The teacher can then use that visual and tactile experience as a foundation for her lesson. Afterwards, the students can repeat the zSpace activity to deepen their understanding of the concept even further. "I really think it has worked to provide our students this opportunity to think about their learning, be reflective about their learning, and then also to deepen their understanding of some of those scientific concepts that we've been working to instill in our lessons," says Einhaus. Lytle, a former teacher, emphasizes the collaborative learning aspect of zSpace. She was part of the company's first pilot program. At that time, the system didn't include the passenger glasses option. As an educator, she was concerned that "the technology was going to take students farther away from working together and really engaging with each other and solve problems," she says. "It was the students who helped us see that they wanted to be together on the system, so we had to figure out the glasses solution." Utica Community Schools has been collaborating with zSpace on the implementation. The company provides professional development for the teachers, as well as information about how to align zSpace content with lessons. For its part, Utica Community Schools provides zSpace with feedback on its educational content. Lytle says the company also shares its plans with the school district to solicit their input. "ZSpace has been very receptive to our input in terms of the additional activities and lessons that would support our science curriculum and our pacing," says Einhaus. ZSpace offers a couple of different pricing models. According to Lytle, most school districts opt for the annual subscription model, which costs approximately $22,000 for 10 zSpace systems, on-site professional development, on-site installation, and the zSpace software and accompanying lessons. Leila Meyer is a freelance education and technology writer based in British Columbia.